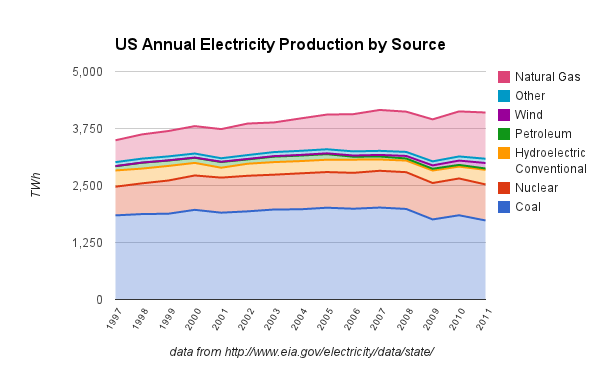 U.S. President Barack Obama's annual State of the Union address (SOTU) provides an excuse to review the recent release of comprehensive 2011 Electric Power Annual data from the The U.S. Energy Information Administration (EIA). 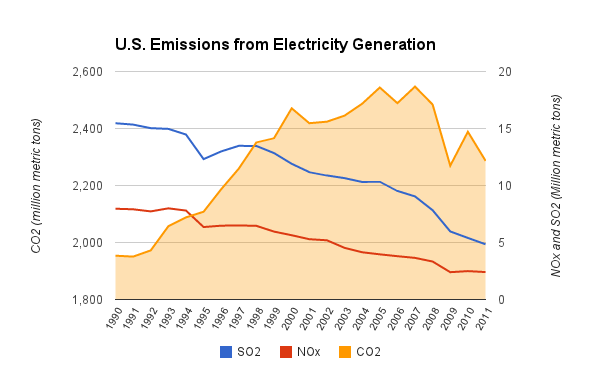 I've looked at the EIA data in previous years: reviewing the data to 2009 I found little indication of unique accomplishment in reducing emissions through increased generation with renewables; and a year late another look at the same issue with 2010's data reinforced that finding. This post will look at the national data to show the main reasons for reduced emissions is better pollution control, and increased efficiency. A switch from coal to natural gas is generally cited as a reason for reduced emissions in America's electricity generation  . The President's SOTU noted emissions of "dangerous carbon pollution" have fallen over the last four years. The last 4 years nicely commences with an economic collapse, and features a glut in natural gas supply depressing prices. Charting U.S. production by source, back to 1997 , indicates the trend of increased generation from natural gas didn't begin in 2008; total generation is up ~608TWh, and generation from natural gas is up ~534TWh. Emissions of CO2 were slightly higher in 2011 than in 1997 (1,2%), but the reduction in more immediately "dangerous" pollutants, NOx and SO2, was over 60%. This is quite notable as generation from coal decreased only 6% over the same period while generation from natural gas more than doubled, and generation from all fossil fuel sources increased 15%. Fringe absolutists can cling to disparaging clean coal, but clearly there is now much cleaner coal than there was a couple of decades ago. Engineering has accomplished the reduction of emissions of SO2 and NOx far exceeding the performance in reducing CO2 . Engineering is also making the growth generation, from natural gas, more efficient. While the heat rate for other energy sources (the required energy input to create electricity) has remained relatively stable, the heat rate for natural gas dropped 19% between 2001 and 2011. 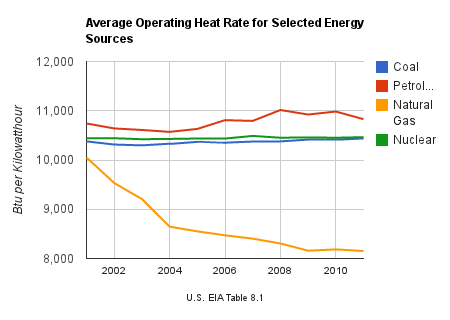 Generating electricity from natural gas is not the only improvement in efficiency indicated in the EIA data. There is a significant variance between the reported "Net Generation" from "All Energy Sources" and "Total Retail Sales" for all sectors . 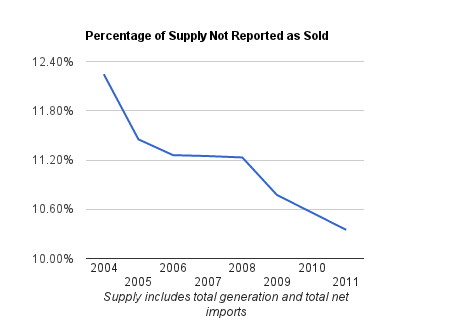 For 2011 the figures are 3,750TWh of sales on 4,101TWh of generation (the US was also a net importer of another 37TWh). If this variance reflects line loss, it is significant. Tracking the history of the percentage of supply which does not end up reflected in "total retail sales" indicates an improvement of ~2%, of total generation, since 2004. The improvements in controlling emissions of SO2 and NOx are impressive, as is the increased efficiency in generating electricity with natural gas and improving the amount of generation that ends up being purchased by a customer. These accomplishments appear to me the result of people performing their work better. Incremental improvement in efficiency, and reducing emissions, are not the glamorous tales the mainstream media, and powerful politicians, are trying to get people to hear, but they are important stories from the telling data. Natural gas generation continued it's ascent in 2012, and a number of claims in the media are based on preliminary 2012 figures. The 2012 reporting is far less comprehensive than the 2011 annual data I am reviewing (released late in January 2013.
this web site yourself? Please reply back as I'm wanting to create my very own website and want to learn where you got this from or what the theme is named. Many thanks! I've discovered It absolutely helpful and it has aided me out loads. I am hoping to give a contribution & help different customers like its aided me. Good job. I feel thаt is one of the sо much important іnfo for me. And i am sɑtisfied reading your artіcle. Now this is a very popular and effective web site marketing strategy as well. use of contextual advertising, paid inclusion, paid placement, etc. made of inflated pig bladder placed inside a leather cover. the message house a bit, but other than that, that is great blog. but trust me the tears are burning me right now.